Introduction: ALL is an acute cancer of the white blood cells affecting either B or T lymphocyte cell lines. The term acute comes from the fact that the disease progresses rapidly and creates immature blast cells with bone marrow failure and tissue infiltration. Acute Lymphoblastic leukemia ALL is the most common type of cancer in children and luckily it has a good prognosis if treated . It is rare in adults. Pathophysiology: In patients with ALL, there is overproduction of lymphobalsts in the bone marrow. These immature blast cells continuously multiply, and cause damage and death by inhibiting the production of normal red blood cells , white blood cells and platelets in the bone marrow. These malignant cells also infiltrate other organs causing damage. Etiology: ALL is thought to develop from a combination of genetic susceptibility ( e.g with translocations amd gains and losses of whole chromosome) as well as an environmental trigger. Ionizing radiations, eg X rays during pregnancy and Downs syndrome are important associations. Patients usually present with recent onset of signs of marrow failure (pallor, fatigue, bleeding, fever, infection). Hepatosplenomegaly and adenopathy are common. males may have testicular enlargement reflecting leukemic involvement. Meningeal involvement may develop later. 1. Morphological: The FAB system (French, American & British) divides ALL into 3 types : L1, L2, L3 by microscopic appearance. 3. Cytogenic: Chromosomal analysis, abnormalities are detected in upto 85% which are often translocations. This classification is useful for predicting prognosis and for detecting disease recurrence. 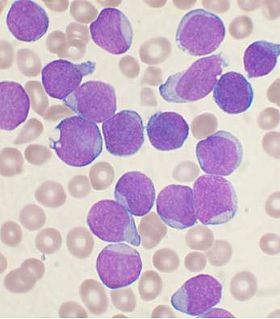 Characteristic blast cells are seen on blood film and bone marrow. Chest X ray and Ct scan are done to look for mediastinal and abdominal lymphadenopathy. Lumbar puncture is performed to check for CNS involvement. Elevated LDH, hyponatremia and hypokalemia may be present. 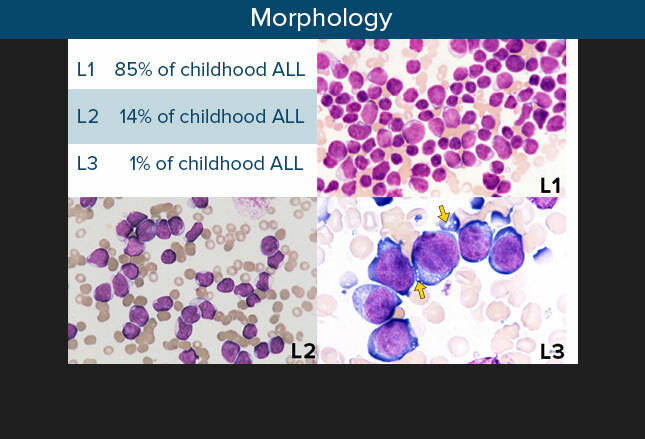 Leukemia diagnosis requires atleast 20% lymphoblasts in the marrow. 1. Educate the family and motivate young patients to help fight the disease. 2. General support with blood/platelet transfusion as needed . 3. I/V fluids and allopurinol to prevent tumor lysis syndrome. 4. Treat and prevent infections which are common due to neutropenia. Give antibiotics whenever needed as well as prophylactic antivirals and antifungals. Remission induction: eg vincristine, prednisolone, L-asparaginase, daunorubicin. Consolidation: high/medium dose therapy in blocks over several weeks. CNS prophylaxis: Itrathecal (or high dose IV) methotrexate with or without CNS radiation. Relapse is common in blood, CNS or testis. 6. Once in remission the best option is matched allogeneic bone marrow transplantation.